God is a communion of love, and we’re invited to join that communion! How can we be one with God? Jesus is speaking to God the Father. In this verse, we can see the communion of God. We know, since Jesus revealed it to us, that there are three persons in the one God. The term which we use to describe the three persons is the Trinity or the tri-une God. Jesus is praying to His Father that His disciples may all be one as the Father and the Son are one. Now, the Father and the Son are one in substance, i.e. they are both the one God. Since we humans cannot become one in substance, that is, we cannot become God, how can we be one with the Son in us and the Father in the Son? We can be united in one, that is, in full communion with the Father and the Son. The Father, and the Son, and the Holy Spirit are a communion–a communion of love–and we can be fully united in that communion of the Trinity. That is what it is to be in heaven–united with God. The communion of God–the Father, the Son, and the Holy Spirit–does not need us in the least. The Father loves the Son completely and perfectly, giving everything He is to the Son. The Son loves the Father completely and perfectly, giving everything He is to the Father. As the Father and the Son love each other perfectly, They give everything They are to each other, even their very existence, and that perfect love brought into existence is the Holy Spirit. The tri-une God loves us so much, that He wants us to become one with the communion of God. How incredible is that?! How undeserving we are to be united with God, yet He still wants us! The beloved disciple, Saint John, says in his first letter (4:8) that “God is love.” There was a heresy in the early days of the Church called Sabellianism, in which the existence of the three persons of God was denied. This heresy was quashed quickly and easily given the multiple references to the Father and the Son and the Holy Spirit in the gospels, e.g. the baptism of Jesus in Matthew 3:16-17, Mark 1:10-11, Luke 3:22 and the commission to teach the gospel and baptize in the name of the Trinity in Matthew 28:19. In the last century, this heresy was revived in the Pentecostal Oneness movement. OK, back to Saint John. He said, “God is love.” If God is love, then God loves. Makes sense, right? We know that God does not change; therefore, if God loves now, He has always loved, even before the existence of the universe. If God is a lover then there must be a beloved. Before the universe existed, God was alone. If God is a lover, who was the beloved? There must have been a “target” of that love. How can one love if there is nobody to love? The Father is the lover, the Son is the beloved, the Holy Spirit is the shared love. God is a communion of love! (And we’re invited to join that communion!) You don’t need to understand the Trinity to believe. Our pitiful, created, finite minds will never comprehend the infinite, uncreated God. As Saint Augustine said: Seek not to understand that you may believe, but believe that you may understand. The Lord–in three persons–visits Abraham. It is in the apostle John’s first letter where he tells us that God is love. 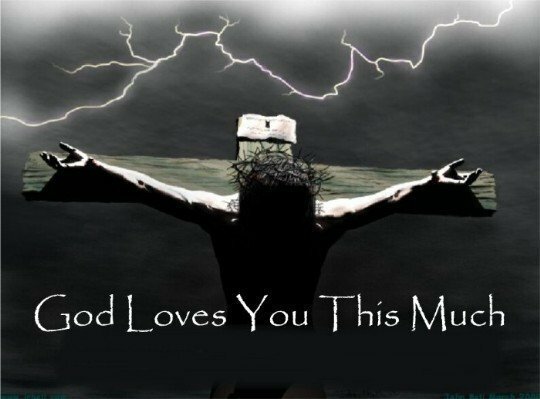 1 John 4:8 – He that loveth not, knoweth not God: for God is love. First let us realize that God does not need us. God was before time and the universe existed, and He was complete in and of Himself. However, if that is true, that God is complete in Himself and has no need of any created being, then how is God love? God is a Father, the Father of the only begotten Son. This indicates only two Persons, though. The third is the Love itself. When a person loves with all his heart, he gives everything to his beloved. He holds nothing back. It is the same with God, but even more so than what is possible with us mere creatures. God the Father loves His Son. God the Son loves His Father. In their love, they give each other everything, even their very existence. The love between the Two is the Third Person of the Trinity–the Holy Spirit. God is a communion of three persons, each loving the other with no need of you or me. God had no need to create anything; however, God created heaven and the angels, the universe, the earth, the flora and fauna, and man (created in His image) to have dominion over the earth–all out of love. He loves us with an unknowable love, and we should love Him because He is OUR FATHER, in heaven, hallowed be His name…and His desire is for us to join Him in heaven, to be a part of that communion of love. He wants so much for us to join Him that He even sent us His only begotten Son (God the Son condescended Himself to become one of us) to be sacrificed for our sake, us miserable sinners. Not only that, but before we go to heaven, we can actually receive the real body, blood, soul, and divinity of the Son of God: 1 Corinthians 11:24 – “Take ye, and eat: this is my body, which shall be delivered for you: this do for the commemoration of me.” And this we do at every mass.